Telestream is teaming up with Microsoft Azure Media Services. This collaboration makes Azure Media Services a live streaming destination in the upcoming release of Telestream’s Wirecast streaming production software. Taking advantage of the direct connection from Wirecast to the Microsoft Azure Media Services ecosystem, large-scale streaming broadcasts can leverage the dynamic scalability, reliability, redundancy and minimum capital investment the cloud offers when streaming live to large audiences with myriad devices. Microsoft Azure recently announced the public preview of its Live Streaming offering. The same Live Streaming solution that seamlessly delivered the 2014 Winter Games and 2014 FIFA World Cup to broadcasters globally – including RTMP ingest capabilities – will now be available in public preview to all customers with the same level of scalability, uptime and reliability. The combination of Wirecast’s powerful new production capabilities with Microsoft Azure’s open and flexible cloud platform, helps make the creation of high quality professional program content easier than ever. By removing the burden of complexity from content owners, they are then free to concentrate on creating the best live content possible. “With Telestream Wirecast’s leadership in live streaming production and Microsoft Azure’s leadership in cloud-based media services and distribution, it was natural to collaborate in order to serve the growing needs of the live streaming market. For media companies, protecting, managing and monetizing content is just as important as creating it. By combining forces with Telestream, we are creating a live streaming platform that offers our mutual customers the best combination of performance and value in the industry,” said Sudheer Sirivara, Partner Director of Engineering, Microsoft Azure. Azure Media Services enables broadcast quality media workflows that are easy to set up, maintain and scale. Users can target all of today’s most popular client devices types including PCs (Windows and Mac OS), iOS, Android, Smart TVs, game consoles, and more. Azure Media Services provides the reliability of a cloud platform backed by a global network of Microsoft operated data centers. A principal goal of adding Azure Media Services as a destination within Wirecast is to make it as easy as possible for streaming content creators to take advantage of all the cloud has to offer. With the latest version of Wirecast, users will be able to create preset templates so that they can log into their Azure Media Services account and start streaming with only a couple of clicks. This integration will be available in Wirecast 6.0, slated for release in Q4 2014. Wirecast 6 will be demonstrated at the International Broadcast Conference (IBC) on stand 7.C12. Priced from $495 to $995, this feature-filled upgrade adds powerful new production capabilities, streamlined workflows, and expanded content source options. 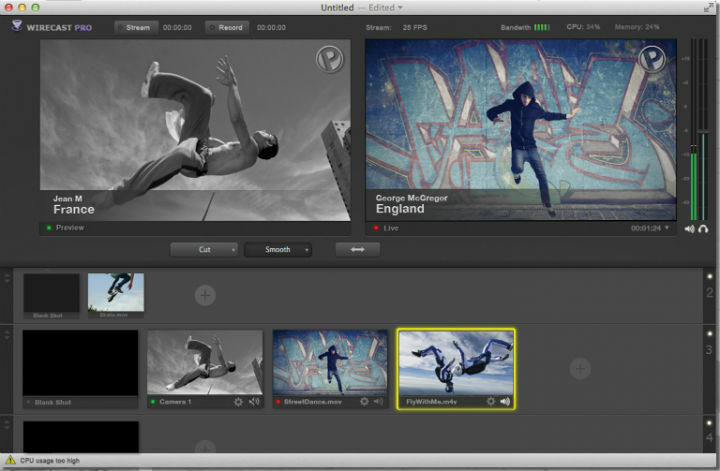 Customers who own Wirecast can upgrade to Wirecast 6 Studio for $149 and to Wirecast Pro 6 for $295.